When you decide to get a new inground vinyl liner pool, you have to decide on if you want a steel or polymer walled pool. Many inground pool specialists offer both types of pool walls, but if they don't, make sure you verify their references well. Any company that is installing vinyl liner pools should be able to offer you both. For the sake of this article, we are going to talk about the graphex polymer pool. 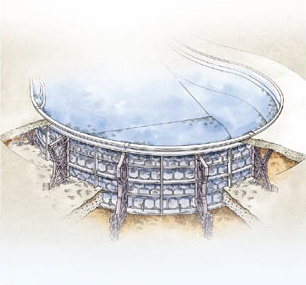 The Graphex Polymer pool is made up of structural resin polymer that will never rust or corrode. The wall has standard vertical and horizontal ribs which is standard but it ALSO has a honeycomb structure to give it even more strength. The added honeycomb support is unique to the Graphex Polymer Pool and gives it the strongest strength ratio on the market. The Graphex pool wall has been around since the 1960's with hundreds of thousands of pools in the ground. Each graphex polymer pool that is in the ground is rust free, I can't emphasize that enough - NO RUST. The polymer pool world exploded as the cost for steel increased, but nothing has the same strength as the graphex pool wall. Many other polymer walls can warp when they are left in the sun, on uneven surfaces, or even crack when it gets cold. The strength and experience of the graphex pool wall is what keeps it at the top of the industry year after year. It doesn't matter how good of a pool wall you have, if your pool build is junk then you will have a junk pool with good walls. Simply stated, make sure that you find a good builder and most times they will offer both steel and polymer pool walls. Both walls have their pro and cons, however the biggest asset you have is that a graphex pool wall will not rust. Like I stated earlier, make sure your inground pool specialist lets you know about both pool walls and what the recommend for your project.